Your opponent cannot Tribute this card, also they cannot target it with card effects. You can only use each of the following effects of “Darkest Diabolos, Lord of the Lair” once per turn. 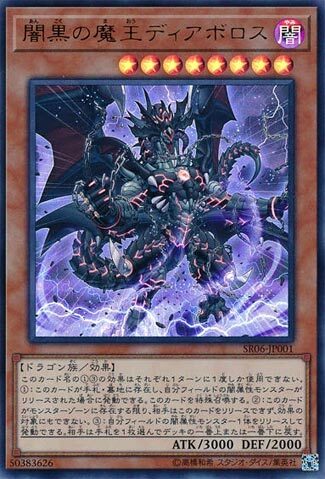 ● If a DARK monster(s) you control is Tributed: You can Special Summon this card from the GY (if it was there when that monster was Tributed) or hand (even if not). ● You can Tribute 1 DARK monster; your opponent places 1 card from their hand on either the top or bottom of their Deck. The boss of the stricture deck: Darkest Diabolos, Lord of the Lair. Anti-Kaiju and anti-Lair of Darkness used by your opponent at the start of this Dragon’s effect, I love it. Protection against targeting effects protects it from Book of Moon, Fairy Tail Snow, Purple Poison, etc. Diabolos can be Special Summoned if you tribute a DARK monster this turn, which shouldn’t be hard if you are playing a DARK-based deck or are using Lair of Darkness. A free summon of your boss monster from either hand or grave gives you more options for this monster (Trade In). Diabolos inherits an effect from the old Diabolos, but makes it better. Instead of seeing the top card of your opponent and placing it back on top or on bottom, you pop a DARK monster and force them to put a card on top or bottom. 1-for-1 hand disruption that turns into a +2 with Lair of Darkness on the field. Diabolos stands on his own as a pretty darn good monster. Great flexibility with Special Summoning, two effects once per turn able to be used, hand disruption and almost complete protection against your opponent makes this boss monster a great choice for any DARK-based or Chaos Dragon decks. We now look at the big boss monster of this Lair of Darkness Structure Deck: Darkest Diabolos, Lord of the Lair. Diabolos is a Level 8 Dark Dragon with 3000 ATK and 2000 DEF. Level 8 Dragons are lovely, Dark is a very good attribute, and stats are great to work with every Virus card excluding Crush Card Virus. While this card is on the field, your opponent cannot tribute this card nor can they target it with card effects. Great effects for protection, your opponent cannot tribute this in a mirror match or for a Kaiju, and targeting is great to stop. This also has two other effects that are hard once per turns. If a Dark monster or monsters you control is tributed, you can Special Summon this from the hand or GY. You can tribute a Dark monster to make your opponent put one card in their hand on either the top or bottom of their deck. Very easy summoning condition for this boss monster, and it is worth having on the field. The second effect can be great for setting your opponent back, unless they put back a card that was otherwise a brick to them, but that isn’t too common as bricks are usually played as one offs. Diabolos is a great boss monster, worth considering for your new Dark decks. Art: 4.75/5 One of the better looking dragons in this game, far better than the original. For midweek, we come to the Boss, the heavy hitter, the darkest of all…Darkest Diabolis, Lord of the Lair, who clocks in with 3000 attack. Your opponent can’t Tribute this card or target it with effects. Two different, and useful forms of protection, right off the bat. Your opponent can’t Tribute it via Lair of Darkness (which is good, as that’d be a real crappy way to have your own card used against use) and target protection is great too. Easily Special Summoned, from the Graveyard OR Hand, when you Tribute a Dark Monster(s), and a semi-lock ability, again when Tributing a Dark Monster, forcing your opponent to place a card from their Hand on the top/bottom of their Deck. He’s fairly splashable, as far as Dark Decks go, at least in my opinion, and quite powerful too. I love a boss monster with protection. Darkest Diabolos, Lord of the Lair is a Level 8 Dark Dragon-type monster with 3000 Atk and 2000 Def. It has some of the best protection a monster can have. It cannot be tributed by your opponent. It also cannot be target by your opponent’s effects, but that’s almost standard on boss monsters. As if that wasn’t enough, Darkest Diabolos has an alternate summoning condition that is perfect for the structure deck. Just have a dark monster you control tributed for anything to Special Summon it from the hand or grave. It needs to be in the grave first but it doesn’t need to be in the hand first, which is weird but better than nothing. The other hard once per turn effect is to tribute a dark monster you control to make your opponent spin a card from their hand to the top or bottom of their deck, their choice. Strong attack on a boss monster with protection and hand disruption makes Darkest Diabolos near perfect. It is perfect in the new structure deck, which is absolutely worth owning in triplicate.